Nebraska football fans saw the Bo Pelini tenure in microcosm while watching NU’s 45-42 loss to USC in the Holiday Bowl. Ugly offensive performances. Head-scratching playcalling decisions. A defense gouged by a power rushing attack. A furious comeback fueled by heart that came achingly close to success. And, of course, a fourth loss to a season. Yes, the next time Nebraska takes the field there will be a new coaching staff in place. But there are still things that can be learned from Nebraska’s performance going forward. Armstrong’s stats for the Holiday Bowl were impressive. He was 32-51 (!) for 382 yards, three touchdowns, and one interception, with 41 yards rushing and another touchdown to boot. But those statistics might be a little misleading. In the first half, USC defenders dropped no less than four sure-fire interceptions. If those picks are made—heck, if even half of those picks are made—the Trojans would have had the opportunity to bury Nebraska in the first half and put a very different shine on the game. In late-game situations needing a comeback (Michigan State, Iowa, USC), Armstrong has been at his best. But he’s also been hopelessly, dangerously erratic and inaccurate early in games. Armstrong has earned his season-long 53.3 completion percentage, which is not going to be good enough to win conference titles. This isn’t to say that Armstrong won’t be the starter. His intangibles are off the charts, and Armstrong does have the experience of a year-and-a-half of starting games. But given the flaws in Armstrong’s game—coupled with the fact that his backup in Johnny Stanton was heavily recruited by incoming head coach Mike Riley when he was at Oregon State—suggest that Armstrong’s game will have to improve if he wants to keep the starting job in 2015. Sure, Nebraska was facing a USC squad still feeling the effect of a scholarship limit, and was able to wear the Trojans down in the fourth quarter as a result. But athlete-for-athlete, Nebraska was able to stay with USC throughout the game. The game was not a mismatch, which was reflected in the exciting, down-to-the-wire finale. Incoming coach Mike Riley has some holes to fill, to be sure. But the cupboard in Lincoln is far from bare. It was certainly jarring to see Nebraska throw the ball 51 (!) times against USC in the Holiday Bowl. But given how beat up Nebraska’s offensive line was, the run/pass ratio starts to make a little more sense. Nebraska was down to its third-string center (which, unfortunately, was likely part of yet another ball-to-the-facemask incident at the worst possible time), and the struggles on the offensive line were a big part of why Nebraska’s rushing attack struggled to gain traction. With an influx of young talent (headlined by guard Tanner Farmer), Nebraska’s offensive line could look radically different in 2015. And with Ameer Abdullah’s graduation, it will have to perform radically better for Nebraska’s offense to have a chance. True freshman receiver De’Mornay Pierson-El made a name for himself on special teams this year, but struggled to make an impact on offense. Pierson-El never had more than four catches in a game prior to the Holiday Bowl, and his fumble against Minnesota did display the dangers of inserting a true freshman into the starting lineup. Against USC, though, Pierson-El had eight receptions for 102 yards and a touchdown. It was Pierson-El, not Ameer Abdullah, whose number was called on a critical fourth down conversion attempt late in the game. It’s hard to know what Nebraska’s offense will look like next year, with a new coaching staff, uncertainty at quarterback, and the return of Jamal Turner. But it seems likely that Pierson-El will be one of the primary offensive weapons for Nebraska next season. Surrender whites, they’ve been called. The all-white look has been castigated by traditionalists and believers in superstition as a fashion travesty for Nebraska. Well, get used to it. 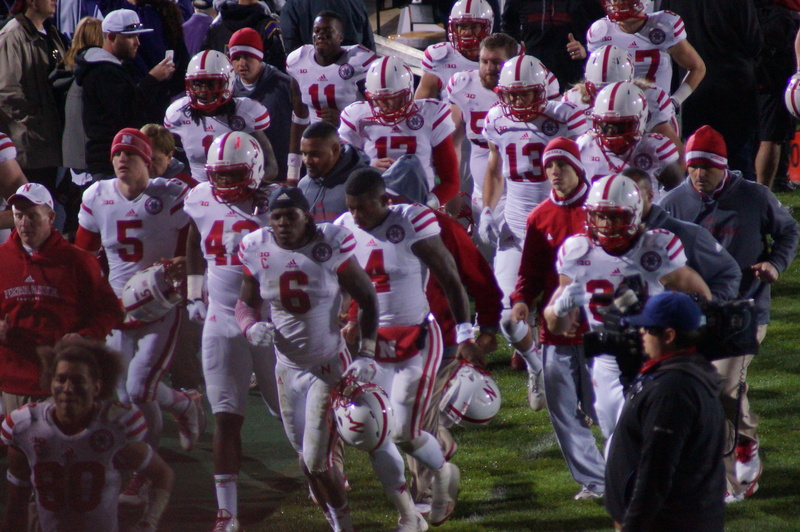 Nebraska has gone stormtrooper (white shirt, white pants) three times this season. Even with a new coaching staff, look for this development from the 2014 season to stick around.